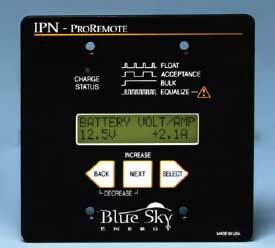 Blue Sky Energy, Solar Boost 3024iL DUO, MPPT Charge Controller, 30 Amp 12/24 Volt, no display, with Factory Installed DUO-Option. 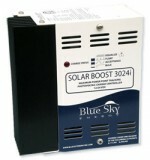 Solar Boost 3024i and 3024iL MPPT charge controllers include a 20 amp load control output. The DUO-Option software converts the auxiliary output into a 20 amp diversion type PWM charge controller. The DUO-Option allows a 3024 to provide charge control for hydroelectric, wind or similar DC generators requiring diversion type charge control while at the same time providing MPPT type PV charge control. 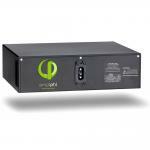 The MPPT PV Power Controller and the new Diversion Power controller operate as a single coordinated charge control system fed by multiple power sources. Operation is similar to the coordinated operation of multiple 3024’s on Blue Sky Energy’s IPN Network. 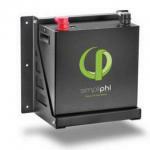 This coordinated approach provides superior battery charge control for hybrid systems compared to using a separate diversion charge controller. The upgrade Duo-Option chip (pictured at right) is factory installed in the SB3024iL, so you don't have to do it!